Passable brownie recipes are everywhere but it has taken some serious searching, testing and tasting to find a truly good brownie recipe. 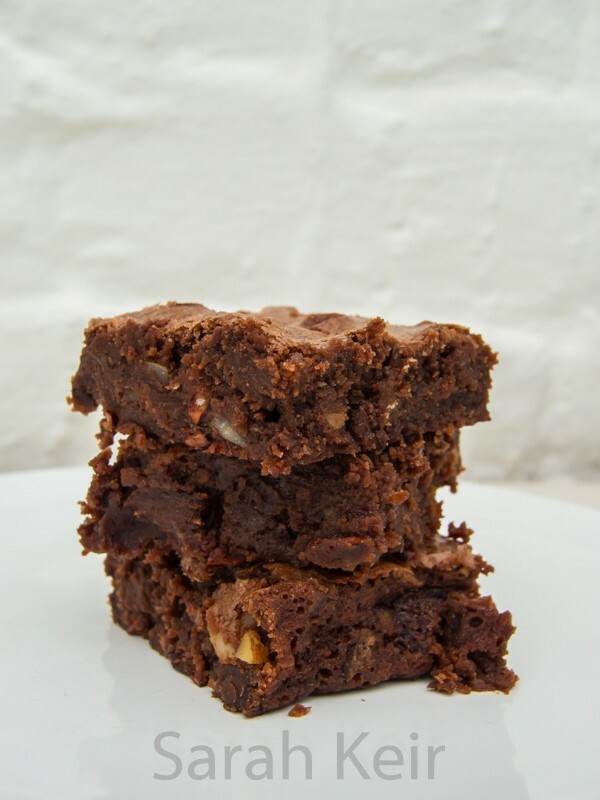 These brownies embody everything I love in a brownie; they’re bittersweet and chewy, where so many brownies are excessively sweet and fudgy (or worse, the dreaded cakey and chocolaty in colour only). Do not skimp on the ingredients here; use the finest dark chocolate you can find as this give the brownies their characteristic chocolaty taste. The chopped nuts and cocoa nibs are absolutely optional so if you like your brownies without bits then just leave them out. 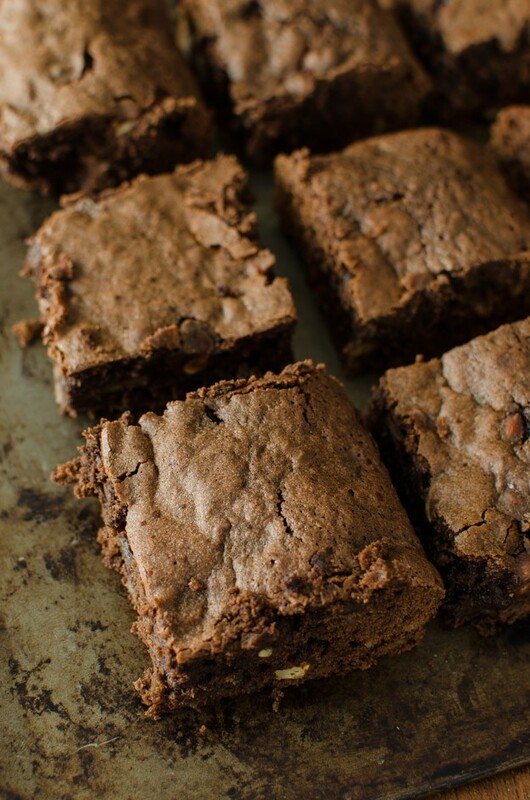 The only obligatory part of this recipe is the stipulation that you should not add a topping to these brownies. I believe that toppings or frostings are only there to hide a second rate brownie; get that Mr Costa! But do not kid your self that without frosting these brownies would be healthy; good for your soul, yes, but not healthy. A once in a while treat. Sorry for the poor photography of these brownies. I took the photos last summer when I was in the midst of madness and although I made the brownies there was no way I was going to have time to photograph them properly. But the over-exposed washed out look seems to be all the rage in food-blog-land (yes, there really is such a place). Since the madness of last year has passed I now have time to clean the house, even weekly sometimes; cook food, most nights too; indulge in some crafts, more of which I will post in this coming week; read books that have sat on the shelf for year. If asked, would I do next year again? Then, no I would not but having done it and achieved it and moved on at least I can learn not to do it again! 1. Preheat the oven to 160°C/ fan 140°C. 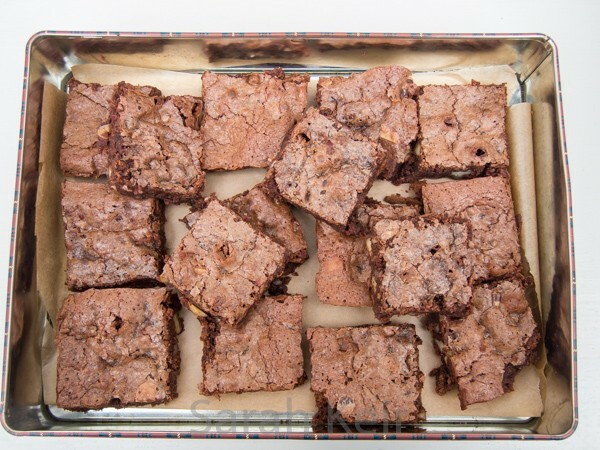 Line an 8″/20cm square pan with foil or baking parchment, leaving overhang around the edges. Grease with butter or spray with non-stick. 2. In a medium saucepan over a low heat, melt the butter and chocolate , stirring frequently until both are melted and smooth. Take off the heat and stir in the sugar then the eggs and vanilla extract. 3. Sieve over the flour and salt and mix in then mix in the nuts and cocoa nibs. Scrape into the prepared pan and level off. Bake for 30 minutes until they are just set (do not test with a skewer, it will still be wet in the centre). Leave to cool completely in the tin then remove by pulling the overhanging foil or parchment and cut into squares.